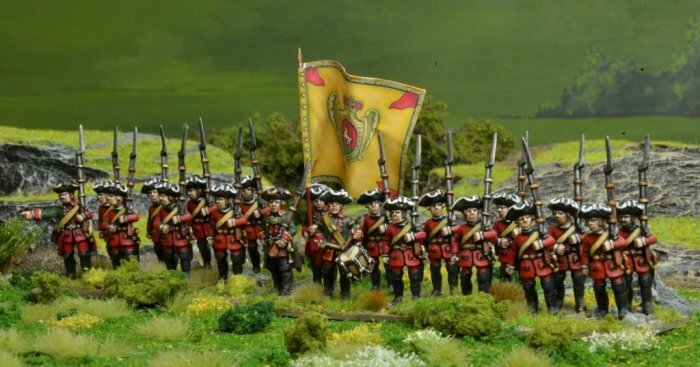 Buy a Seven Years War Infantry Unit of your choice with this Crusader Miniatures deal. The deal is a 20 man Infantry unit. Each unit is made of 16 musketeers and 4 command figures, You choose what army you want it made up from. If you are not sure, drop us an email and we'll explain it more. All Crusader Miniatures Seven Years War are 28mm sized metal figures, supplied unpainted. You will need to supply your own wire flagpoles and paper flags where needed. The photograph show a Russian unit from the collection of Dave Woodward.